Vegetarians, generally, and vegetarian athletes, specifically, are often asked how they get enough protein without meat. While I’m no longer vegetarian (I regularly eat fish and very selectively eat meat), I appreciate the health benefits, variety, convenience, and flavors of vegetarian meals. 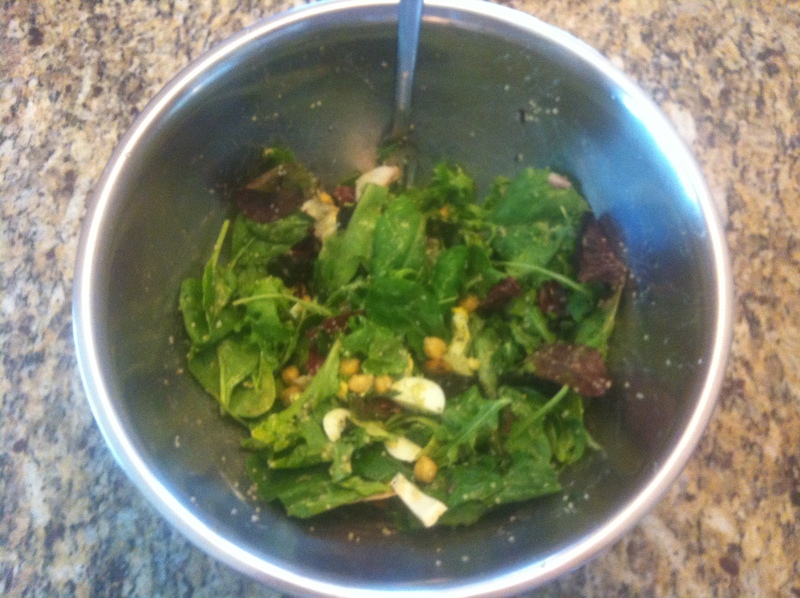 Short on time today, I threw together a salad of sorts that is typical of about 5 of my meals a week. Sometimes I’ll have one for lunch or dinner but it is just as common for my breakfast or a snack. There’s not much to it but it tastes great and fills me up. It is about as healthy as anything I can make or buy and is full of all the stuff my body needs to recover and rebuild. I toss all the ingredients in a large mixing bowl – the volume of the salad is about as big as two entree-size meals from a restaurant. The base is 3-4 large hands-full of mixed greens and the rest is whatever I have around but I make sure to have a couple sources of quality fat and protein.